Before we begin a full review of the 2013 Ford Escape, we thought it would be interesting to note Ford's unique position as it pertains to advertising this SUV. With a quick visit to Ford's media room, you'll find that the automaker has done everything from associating it with food drives, awards and distinctions, and ping-pong balls. The latter is especially interesting: Ford measures interior vehicle volume by how many ping-pong balls fit inside. They claim it's more accurate than other forms of measurement, and hey, it's certainly pushes curiosity-driven Ford Escape buyers in Dallas to see how and why ping-pong is mentioned in the same headline as an SUV. Another interesting tie-in is the relationship between pets and this newly redesigned vehicle. The Blue Oval says the Ford Escape in Dallas (or anywhere, really) is a pet's best friend. It features a low bumper height so animals can easily jump in and out of the vehicle, it can be equipped with an optional hands-free liftgate that allows owners to swipe a foot under the bumper to open the trunk (when their hands are full of pet food or cages, of course), and it has metal trunk loops drivers can attach to an animal's leash so they don't run around the vehicle or jump out after you open the liftgate. This association with pets results in an interesting metonymic leap, but no more so than linking a Ford Escape in Dallas to ping-pong balls and food drives. With all of that said, we're glad Ford is getting creative with ways to show their latest SUV to the masses. Well, that's enough rambling for now. Scroll past the video below to read Grapevine Ford's review of the 2013 Ford Escape for Dallas-area shoppers. Full model specs, features, mpg and more await your eager eyes. When comparing the 2013 Ford Escape head-to-head with the 2013 Honda CR-V, Subaru Forester and the Toyota RAV4, and you'll notice that the Escape wins over those autos in oodles aspects. Get a load of just a few of the reasons below. Get actual factory parts and fantastic workmanship from Ford technicians at a locale that's just a brief journey from your neighborhood. At our Ford auto repair center in Grapevine, we offer this and a generous warranty on all jobs! 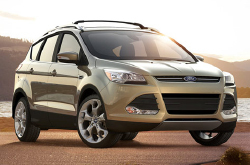 The buffs at our TX Ford service center can be trusted to keep your Escape in robust form for years to come. We handle a slew of jobs, including everything from regular oil changes and windshield wiper replacement to challenging tasks like shock and strut maintenance and more. Grapevine Ford is your number-one choice in Grapevine for fast, professional Ford Escape repairs and regularly scheduled maintenance. Find unbelievable service coupons at Grapevine Ford by clicking underneath this sentence! The new Ford Escape is certainly an exciting SUV with a bright future. Thanks to new tech innovations, all-new styling and powertrain options, it represents a huge leap forward for the automaker's line of SUVs. 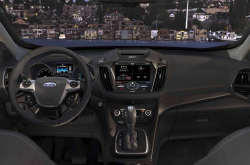 Dallas Ford Escape shoppers are invited to contact Grapevine Ford to set up a test drive or simply learn a little more about this transformative SUV. A variety of buying, leasing and financing options are available with low APR rates and terms for qualified buyers. Visit the leading Ford dealer in the Dallas-area, Grapevine Ford you'll be glad you did!